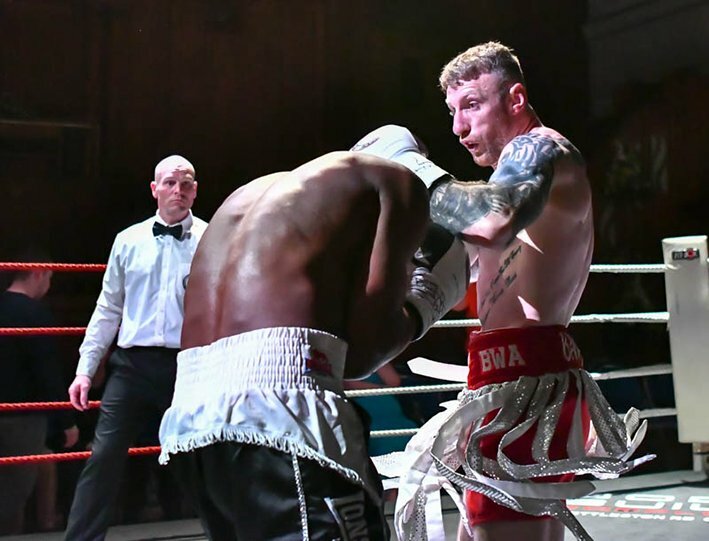 Ringside Report by Gianluca Di Caro – Photographs Courtesy of Kevin Thorne – On Saturday night fans of the Pugilistic Arts turned out in force to support local hero George McIlroy, as he challenged Ghanaian Godwin Cudjoe for the Professional Boxing Council (PBC) International Middleweight Crown at the Ayr Town Hall, Ayr, Scotland. Before we get to the boxing action, preceding the fights there was a ten bell salute for Kenny Barr, the Vice President (Scotland) of the British & Irish Boxing Authority (BIBA), who sadly passed away just before Christmas. It was a fitting that the eulogy was made at this event, as it was Kenny Barr, a long time friend of George McIlroy, who persuaded the Ayr fighter to come out of retirement last year, dangling potential title fights as the carrot. OK onto the fights now, in reverse order with the main event first. McIlroy, who already holds the PBC International Middleweight Silver title, was clearly fired up, no messing about, right from the off he went straight on the attack letting rip with a couple of big straight rights. Cudjoe responded well with an equally powerful shot before getting behind his jab in an effort to keep the marauding Scotsman at bay. Despite the efforts by the Ghanaian to keep his opponent at arms length McIlroy continued to push forward and landed a cracking hook followed by another big right. Cudjoe went straight back to using his jab to good effect, however McIlroy just walked him back towards the ropes and let rip with a big left followed by an equally vicious short sharp left which sent the Ghanaian towards the canvas. Initially McIlroy walked away towards a neutral corner, but soon realised that Cudjoe had hooked his arm over the top rope, which had prevented the Ghanaian touching down, so quickly turned back towards his opponent and proceeded to let rip with venomous series of big lefts and rights. The onslaught proved way too much for Cudjoe, and down he went. The Ghanaian made the count but was a little unsteady on rising, however he soon recovered his composure enough for Referee Edward Law to allow the fight to continue. Right from the restart McIlroy went in hard and fast, letting a huge left hook fly before following up with a left to the body followed in quick succession by another scintillating combination of a left hook, a big right followed up with another big left hook, which sent Cudjoe down for the second time. On the restart McIlroy went in with a solid jab, which forced Cudjoe into a neutral corner, with his opponent corralled into the corner McIlroy then proceeded to let rip with a massive double-handed assault to body and head. As Cudjoe had covered up and wasn’t defensively responding with any punches of his own Referee Edward Law began to move forward and prepared to jump in and stop the fight just as McIlroy threw a lightning fast uppercut that sent the Ghanaian to the canvas for the third time and in an instant the referee waved the fight off, on the one minute and fifty nine seconds mark of the first round. Preceding the McIlroy-Cudjoe contest was due to be another PBC Title fight, this time at Welterweight between another local star, Sammy Hill and Ghana’s Prince Ofotsu, however due to visa issues the Ghanaian failed to make the trip, so promoter Lee McAllister hastily arranged a replacement in Latvia’s Maksims Jegorovs, but due to not being suitably ranked the fight was deemed a non-championship six rounder. Sammy was clearly still smarting from not fighting for the title as he came out of his corner like a raging bull as the opening bell rang. The Scotsman then proceeded to fire a massive exocet of a right; followed shortly after by a double-handed combination and that just about set the tone for the rest of the fight. Don’t get me wrong, Jegorovs fought his heart out, when the opportunity arose, but Hill was taking no prisoners and just kept coming forward letting rip with powerful combinations to body and head at every conceivable opportunity. As the round headed towards the second minute mark, Hill stepped up the pace, and viciousness of his assault so much so that he backed the Latvian into a corner neutral corner following a mighty right to the body. Initially Jegorovs responded with a jab but soon covered up as the Scotsman let rip with massive series of left and right-handed combinations to body and head. Jegorovs then made the fatal mistake of throwing a big right which fizzed past Hill’s head but left a massive opening which the savvy Scotsman wasn’t going to leave unpunished and he proceeded to pepper body and head once more before letting rip with a massive left to the head that sent Jegorovs down heavily. Referee Edward Law immediately stopped the contest on the two minutes and sixteen second mark and called the medical team into the ring to attend to Jegorovs. Prior to the Hill-Jegorovs war was a six rounder featuring rising local prospect Leon Roberts against Belfast’s Marty Kayes. The opening encounter see both lads tentatively testing the water, Roberts utilizing his superb jab and Kayes with a little flurry of shots, but as the round moved into the second minute Kayes took the initiative and started to let rip with some nice combinations, initially Roberts responded with a right hand but soon settled for using his jab to try and keep the terrier like Kayes at bay. More of the same in the second, Roberts just utilizing his jab, whilst Kayes was much busier and landing some very good hard combinations, but the third see Roberts far more attack minded. I was surprised to see Roberts again reverting to his jab in the fourth, again Kayes was by far the busiest of the two and as in the earliest rounds was not only taking the fight to the Scottish youngster but also landing the best shots unhindered. The fifth was a cracking round with both lads stepping up the pace, this was such a close round it could only possibly be deemed a drawn round. The sixth and final round virtually mirrored the second round, with Kayes being the busier of the two, as well as landing the best shots. After six entertaining rounds Referee Edward Law’s score was read out, 58-57 in favour of Belfast’s Marty Kayes, which sent some of the local fans into a rage, with a number of them venting their disappointment at the officials ringside, well that was short lived as the security team efficiently stepped in to prevent the situation getting out of hand. Have to admit I was surprised that Roberts never quite got up to pace, or really positively displayed the undoubted talent and skills he possesses. I was lucky enough to watch him when he fought and beat Paul Peers, now that was tough old fight, a full on war, yet he came through with flying colours. Before the midway break Nathan Beattie took on Latvia’s Dinars Skripkins for the PBC International Lightweight Silver title. What a cracking closely fought contest, every round was a doozy, with both lads boxing superbly. Skripkins, who took the fight at late notice after original opponent Ilja Sovdra withdrew due to illness, really made this a fight to remember, taking the fight to the Scotsman at every opportunity. Beattie on the other hand was more than happy to work at his own pace, utilizing his jab to good effect and when needed quite happy to trade punches. After eight beautiful rounds of boxing Referee Edward Laws scorecard was read out as 79-74 in favour of Nathan Beattie. I have to say that the 79-74 score really doesn’t reflect just how close each and every round was. The second fight of the night see Aberdeen based Aussie Dillon Zammit make his pro debut against another debutante Latvia’s Dmitrijs Parohonko in a four rounder. Both boxers nerves clearly played a big part of the inaction of the opening thirty seconds or so, whereby both lads basically shadow jabbed, but once they settled down it was all out war. As the fight entered the second minute Zammit was the more controlled, the youngster calmly picking his shots, whilst it took a little longer for Parohonko to settle, initially most of the Latvian’s shots missed their target. As the fight progressed Parohonko began to get his shots more controlled and more importantly on target, however this wasn’t to last for long as following a flurry of double handed combinations, Zammit landed a pin-point accurate shot to send the Latvian to the canvas. Parohonko made the count and both lads went at it hammer and tongs until the bell signalled the end of the first round. Round two started out at a good pace, both fighters now seemingly fully settled down. Zammit remained calm and picked his shots, Parohonko began to also land the odd accurate shot but still kept slipping into the earlier habit of throwing wild shots, which turned out to be his downfall as the round moved toward the half way mark. Zammit corralled Parohonko into a neutral corner and once more began throwing scintillatingly fast double-handed shots to send his opponent down to the canvas once more. Referee Edward Law decided enough was enough and waved the fight off on the one minute and thirty seven seconds of the second round. The opening fight of the night caused a bit of a sensation in itself, however the real shocker was who stepped in the ring to face Heavyweight Lee Kellett, no less than three weight World Champion (Lightweight, Super Lightweight and Welterweight), not just former either McAllister is the current World Boxing Foundation (WBF) World Champion, who stepped in at late notice to save the fight following Kellett’s original opponent being unwell. Believe me this wasn’t an exhibition match, far from it as both fighters really went for it right from the opening bell. Mind you, Kellett really had his work cut out for him, as unlike most opponents the Cumbrian had fought over the years, McAllister moved at a very fast pace, lithely avoiding the big shots Kellett threw with amazing, almost ‘Matrix’ like movement. It wasn’t just his movement either, McAllister, whilst barely scraping into the heavyweight division at just 14st 5lbs, was more happy to tear it up with his much bigger opponent at times. You just couldn’t take your eyes of the fight for a second, it was non-stop, normally I’d say action, but this much more, it was intriguing to watch the tactics of both fighters play out, again I suppose I am really talking about McAllister’s movement and the efforts of Kellett to try and guess where the ever mobile McAllister will be so he could tag him with some big shots. After four highly entertaining rounds Referee Edward Law scored the contest 39-37 in favour of Lee McAllister. I really, really enjoyed the night, it was a great show, with a highly enthusiastic and appreciative crowd, even the incident involving the handful of Leon Roberts’ fans didn’t detract from that, and most of all some sensational all action fights. No doubt about it Small Hall Boxing is alive and well in Scotland.